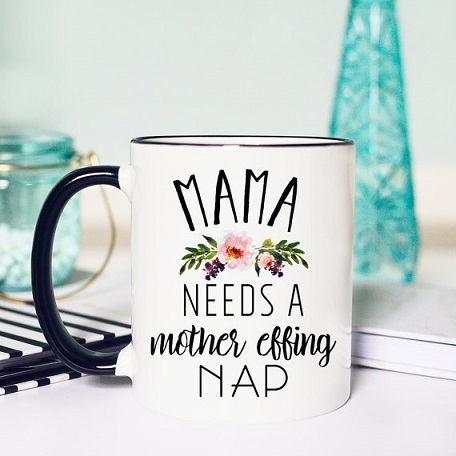 Mamahood Series: Mama needs a mother-effing nap. — Brooke Ellen, Inc.
Mamahood Series: Mama needs a mother-effing nap. Available on Etsy . . . because you know you need one. To be honest, I am not really sure when it happened. One day I am standing in my 5” heels throwing together an outfit that is both on-trend AND budget friendly (because, priorities), and then what seems like the next day, I pass by a mirror wondering who (or what) I am looking at. There is this stranger in the mirror staring at me, and I can’t help wondering when she last brushed her hair or showered. (Or, on a more specific occasion . . . I am looking at this person in the Old Navy mirror who has somehow managed to turn boyfriend jeans into mom jeans without breaking a sweat. Confused? See my post about mom jeans, but you know, spoiler alert.) As I am sitting here trying to figure out this great mystery, I have to ask myself, “Why is it so damn hard to just take a break?” Is it the feeling of guilt? Maybe. Is it the stress of leaving things unfinished, or the thought that I am being selfish for taking a minute for myself? Probably, at least a little bit . . . for me anyway. Truthfully, I am even struggling with this concept as I am typing out this post. Here I am trying to take a minute to work on something that is just “mine” and yet, I am thinking about all of the laundry I should be doing or the dishes in the sink I should be washing. Clearly I have some work to do in this department. You may have heard the phrase, “You cannot fill up someone else’s cup if yours is empty.” I never realized how much truth that little fortune-cookie saying held until a couple nights ago. As you may know from a previous post of mine, we recently took away our toddler’s pacifier. As of today, we are on day 12 and it is not going . . . awesome? While C is not so angry about the paci death anymore, the screaming at any and all sleep times has become part of his routine . . . except now it is fake. ANYWAY, he woke up around 2am the other night and launched right into this fake cry/scream. Between listening to this scream for a minimum of three hours a day for several days straight and being beyond exhausted as is life with a toddler and infant, I forgot the meaning of the word "patience" and went straight into my new alter ago: Warden Jess. I walked into C’s room and started scolding him. I had this total out-of-body experience as if I was watching myself yell at my baby, but I somehow couldn’t pull it together enough to chill out. After putting C back to bed (MUCH to his dismay), I returned to my room still absolutely fuming. After digesting the situation a bit, I became more and more upset with how I handled the situation. I realized that maybe it wouldn’t have gone down that way if I had taken a break for myself at some point in the pacifier transition to just hit reset. I was completely running on empty. Let me be clear. I am not saying that I need to take a break FROM my kids. I am saying that I need to take a break FOR me. I have realized that I have almost forgotten that I was a person before I had kids, especially since I am at home with them and taking a break from my career. It has become so easy to get wrapped up in my children’s needs, my husband’s needs, housework, dinner . . . I can go on and on. But, as you know, taking a break for yourself is much easier said than done. I’ve realized that as I try to work “time outs” into my schedule, the biggest thing for me is to set realistic expectations and to learn how to pivot if something isn’t working. Was it realistic for me to try to do a 20 minute Jillian Michaels workout with both of my kids around? Hell no. That was, what I will call, poor judgement. Between my newborn crying non-stop as soon as I hit “play” and my 2 year old trying to throw my weights at the dogs, I ended the workout more stressed than when I started. (It also didn’t help that no one on earth makes me as angry as Jillian. Learn to count, Jillian. A “couple” more reps means two, not eight.) But, I need a physical outlet to relieve stress and to help me feel more like myself. As the weather has started to warm up a bit, I try to take 20-30 minutes to run. This time away doesn’t always work for my schedule, nor is it pretty or fast by any stretch of the imagination. (I also have been known to fake taking a picture just so I don’t hyperventilate.) Running for me isn’t the most fun thing in the world, but it has become a very effective way for me to . . . well . . . breathe, ironically. I know, I know. Sometimes those quick breaks just won’t cut it. Sometimes you need to take a few hours (or after a more challenging week . . . an afternoon) away to recharge. (I would LOVE to just go to a hotel and sleep for several hours, but those “rent by the hour” hotels probably aren’t the best mommy-choice I could make.) Luckily for me, my husband insists on my “walking away” a couple hours every weekend. This “suggestion” from my husband may or may not have had to do with my mental state from cabin fever with both boys OR his general concern for his own safety. Regardless, he pushes me to leave for a bit when our schedules allow. Truthfully, the first time I did this I just sat in my car because I had no idea what to do with myself. I ended up at the black hole that is Target and shopped for my kids and hubs. The second time was a little better . . . but Target drew me back like a magnet, and I bought the boys Easter clothes. (I told you I have some work to do in this department.) This last time was a bit easier to recharge as I ended up at a winery (PRAISE) and then the lake (Cleveland FTW) with a friend! Whether you take a walk, spend some time at a lake, go to a movie, or spend two hours at target . . . just do something that makes you happy. Yes, I still have so much to learn in this area, and I need to get better at allowing myself to breathe for a minute. I have realized, however, that when I do a few little things for myself here and there, I feel like I am a better mom. I am calmer, have more patience and laugh a bit easier. You really can’t fill up anyone else’s cup if yours is empty . . . and while I may want to fill mine with coffee wine (THIS IS A THING AND IT SOUNDS WONDERFUL. ), I know that I want to be able to fill up my kids' cups as full as they can possibly be. Honestly, it’s probably good for my kids to take a break from mommy every once in a while, too. (Even as amazing and wonderful as I am . . .) These small or bigger breaks are necessary for us and our family. And, hey, it beats my husband finding me rocking myself in a corner at the end of the day. . . although . . . that could be a break too, right? Jess Schultek, creator of the blog Life and Loud Noises, is a wife, momma of two boys and self-proclaimed DIYer. While taking a break from her profession in the marketing world to be home with her babies, she writes about life with her sweet (and crazy) boys, bad dogs and the insane things that happen to them that sound completely made up. Jess Schultek, creator of the blog Life and Loud Noises, is a wife, momma of two boys and self-proclaimed DIYer. While taking a break from her profession in the marketing world to be home with her babies, she writes about life with her sweet (and crazy) boys, bad dogs and the insane things that happen to them that sounds completely made up.